The panel has been trimmed on all four sides but little of the painted surface can have been lost. It is made from two boards of Baltic oak, both from the same tree; the last ring was formed in 1372. Black overpaint conceals areas of damage on our left of the Virgin`s face and on our left of the Child`s head and torso. On our right of the Virgin, a similar area of black overpaint may hide a shadow cast by the Virgin across the back of the niche. The painting probably reached Spain during the fifteenth century. The earliest known owner was the Infante Luis (1727-1785), youngest son of Philip V. In the inventory of his possessions, taken in 1797, it was listed as by Dürer. It passed to his descendants and was sold on 23 March 1899 at the Palacio de Boadilla to Pedro Fernández Durán (1846-1930), who bequeathed his collection to the Prado. The picture is so obviously similar to the Miraflores Triptych (Berlín, Staatliche Museen, Gemäldegalerie inv. núm. 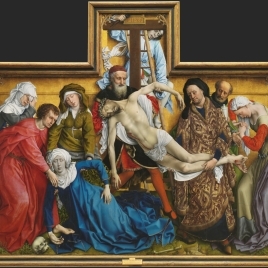 534a) and the Prado Descent from the Cross (P2825) that its attribution to Rogier van der Weyden, made in 1931, has never been doubted. The Virgin is seated within a niche of grey stone, probably semi-circular in section. The base of the niche continues into a curved projection with a decorated base. It is not obvious how the Virgin and Child can enter or leave their niche; they are isolated there like polychromed statues. Her robe of red cloth has a lining of green silk, turned back at the cuffs and hem. Her underdress, of purple velvet cloth of gold, is trimmed with white fur. It would have been subtly ostentatious to wear so rich a textile beneath a robe. The Virgin`s semi-circular mantle, of the same red cloth as her robe, is decorated along the edges with embroidery in gold thread and pearls. Both her feet are visible in the lower left corner. The Child, wearing a white shirt, is turning the pages of a manuscript written on parchment. There is a blue initial B but the rest of the text, in black and red, was never legible. It was created, according to the usual practice of Rogier and his contemporaries, by painting patterns of horizontals crossed by short verticals and dragging the wet paint with dry brushes. The book is presumably the Old Testament. The angel bearing the Virgin`s crown resembles the angel in the centre panel of the Miraflores Triptych, though here his face, hair and hands are rendered in natural colours. 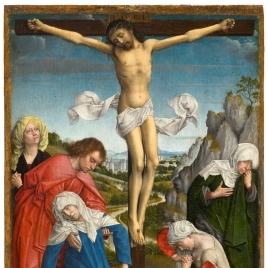 His robe is purple, like the angel`s robe above Extreme Unction in the triptych of the Seven Sacraments (Amberes, Koninklijk Museum voor Schone Kunsten, inv. 393, 394, 395). The crown incorporates fleurs-de-lis. The stone tracery resembles the more complex wooden tracery of the Miraflores Triptych and the Descent from the Cross and is contained within a similar round-topped ogee. Images of the Virgin and Child where one of them holds a book were fairly common in the sculpture made in Tournai, Brussels and Burgundy. 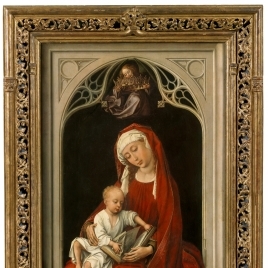 Rogier himself painted an altarpiece of the Virgin and Child with Six Saints where the Child, supported on the Virgin`s knees, is writing in a book held by Saint John the Evangelist. Those figures of the Virgin and Child were frequently repeated, often in reverse, in works by Rogier`s imitators. It is likely, given the close resemblances between the Durán Virgin and the London Magdalen reading, a fragment from the Virgin with Six Saints, that the two compositions were executed at much the same period. Numerous copies and versions of the Durán Virgin show that it was admired all over Europe, especially in France and Spain. Relatively few of these versions would have been copied directly from the original; most would have been taken from preliminary drawings or record copies. The earliest datable copy is by an illuminator working in Paris between 1443/4 and 1450. Infrared reflectograms and X-radiographs of the Durán Virgin reveal a great many changes. The complicated alterations make it very difficult to interpret the images. 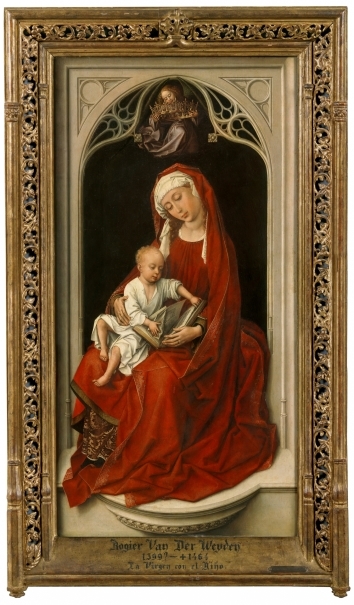 Rogier seems to have begun by drawing with a relatively thick and loaded brush a suggestion of an arch and the figures of the Virgin and Child. The detail of the spandrels was rudimentary; the tracery and the angel did not appear and their place was taken by a conical canopy similar to that in the so-called Medici Virgin and Child with Four Saints (Frankfurt, Städel Museum). This canopy was painted, with its point centred between the angel`s head and his left wing and its drum just above the lower contour of the angel`s robe, well clear of the Virgin`s head. In the underdrawing, she was presented full face with downcast eyes; her mouth was level with the end of the visible Virgin`s nose; her neck was attached to the base of the visible neck. The Child was in much the same pose, though his right eye was painted lower than the underdrawn eye and the painted ear is much better proportioned than the underdrawn ear. The positions of his arms and legs have been changed. The base of the niche is underdrawn as a simple, curved step; the mouldings and carved decoration are not present. The Virgin`s face was painted initially in a different place from the underdrawn and visible faces. The first painted nose is visible in the X-radiograph on our right of the visible nose and is inclined away from the vertical of the underdrawn nose. A corresponding mouth may be discerned in the reflectogram and there appear to be traces of a corresponding, open eye (her left eye). The visible head, further inclined to our left, is in the third position tried: a very daring one, for the Virgin`s head is at such an angle that her neck seems almost to be broken. The angel with the crown replaces the canopy. The tracery was painted last; but the decisions to include the angel and the tracery may have been taken at the same time. It would have been simpler to paint the tracery on top of the completed angel. Some of the versions have been made from a pattern drawing prepared before the canopy was replaced by the angel. The possible links between the various states of the original and the various versions should be further investigated. It is most instructive to study the processes of change by which Rogier arrived at the seemingly effortless beauty of his composition, with its subtle references to the Passion of Christ. He has constantly created and revised patterns of parallel and perpendicular diagonals, isosceles and equilateral triangles. Areas of intricate linear pattern contrast with passages of greater simplicity. The contour of the Child`s forehead coincides gracefully but improbably with that of the Virgin`s veil and the golden edge of her mantle. The muted green and purplish surfaces, the golden threads and crown and, above all, the white areas of textiles and pearls punctuate the rhythms and direct the observer around the geometric harmonies that stabilise the composition around the Child`s slightly jarring crumpling of the two central leaves of parchment (Campbell, L.; Pérez Preciado, J. J.: Rogier van der Weyden, Museo Nacional del Prado, 2015, pp. 82-86). Height: 100 cm. ; Width: 52 cm. Friedländer, Max J., Die altniederlandische malerei /, II, Paul Cassirer, Berlin, 1924, pp. 89 Lám. 137. Sánchez de Rivera, Daniel, Las nuevas salas del legado Fernández Durán, Arte español, 10, 1930/31, pp. 180. Michel, Edouard, Roger van der Weyden, Plon, Paris, 1945, pp. 7. Dohmann, Albrecht, Die Altniederlandische Malerei des Funfzehnten Jahrhunderts, E.A.Seemann BuchUnd Kunstverlag, Leipzig, 1964, pp. lám. 80. Huysmans, J.K., Trois primitifs: les Grünewald du Musée de Colmar Le Maître, Flammarion, Paris, 1967, pp. 162. Panofsky, Erwin1892-1968, Early netherlandish painting: its origins and character, I, Icon Editions, Nueva York, 1971, pp. 259. Davies, Martin, Rogier Van Der Weyden: an essay, with critical catalogue of paintings assigned to him and to Robert Campin, Phaidon, Londres, 1972, pp. 226 Lám. 71. Smolar-Meynart, A. Eeckhout,P. 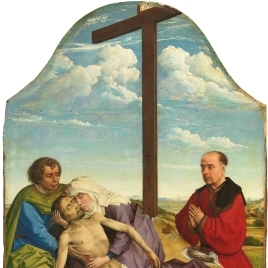 Deknop, A. et al., Rogier van der Weyden. Rogier de Le Pasture. Peintre officiel de la Ville de Bruxelles, Crédit communale de Belgique, Bruselas, 1979, pp. 143. Bermejo, Elisa, La pintura de los primitivos flamencos en España, I, C.S.I.C., Instituto Diego Velázquez, Madrid, 1980, pp. 112-114. Courthion, Pierre, La Peinture Hollandaise et Flamande, Fernand Nathan, 1983, pp. 27. Harbison, Craig, Realism and symbolism in early Flemish painting, The art bulletin (CAA), 66, 1984, pp. 595-596. Silver, Larry, The Paintings of Quinten Massys: with catalogue raisonné, Phaidon, 1984, pp. 199. Forsyth, W.H., A Fifteenth-Century Virgin and Child attributed to Claux de Werve, Metropolitan Museum journal, 21, 1986, pp. 41-63. Delenda, Odile, Rogier van der Weyden. Roger de la Pasture, Editions du cerf tricorne, Paris, 1987, pp. 45 Lám. 17. Museo Nacional del Prado, La pintura flamenca en el Prado, IbercajaFonds Mercator, Amberes, 1989, pp. 34. Panofsky, Erwin1892-1968, Les Primitifs Flamands, Hazan, Paris, 1992, pp. 457, 458 Lám. 326. Klein, Dan, The History of Glass, Orbis, Zwolle, 1992, pp. 20-21,232-235. Les primitifs flamands et leur temps, La Renaissance du Livre, Belgique, 1994, pp. 130. Martens, Didier, Le rayonnement européen de Rogier de la Pasture (vers 1400-1464) peintre de la Ville de Bruxelles, Annales de la Societé Royale d'Archéologie de Bruxelles, 61, 1996, pp. 9-78 [59-74 f.20]. Panofsky, Erwin1892-1968, Los primitivos flamencos, Ediciones Catedra, Madrid, 1998, pp. 256 Lám. 107. Martens, Didier, Metamorfosis hispánicas de una composición de Dieric Bouts, Goya, 1998, pp. 4. Campbell, Lorne, The Fifteenth Century Netherlandish Schols. National Gallery catalogues, National Gallery Publications.Yale, Londres, 1998, pp. 392-406. Dhanes, Elisabeth Dijkstra, Jellie, Rogier de la Pasture Van der Weyden. Introduction a l' oeuvre. Relecture des sources, La Rennaissance du livre, Tournai, 1999, pp. 29 Lám. 28. Vos, Dirk de, Rogier Van Der Weyden: The complete works, Harry N. Abrams, New York, 1999, pp. 189 Lám. 116. Museo Nacional del Prado, Pintura flamenca de los siglos XV y XVI: guía, Museo del Prado, Aldeasa, Madrid, 2001, pp. 82. Campbell, Lorne, Van der Weyden, Londres, 2004, pp. 50. Martens, D, Du Saint Luc peignant la Vierge à la copie des maîtres: la 'norme en acte' dans la peinture flamande des XV et XVI siècles, Revue belge d'archéologie et d'histoire de l'art, 74, 2005, pp. 3-49 [18-20]. Benedicto García, Eugenio, El asesinato en 1465 de Jehuda Alitienz, de la judería de Huesca, Sefarad, 71, 2005, pp. 287--325. 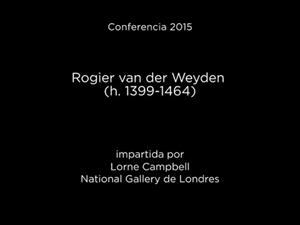 Reynolds, Catherine, ''Netherlandish Patterns in Fifteenth-Century Paris : Campin, van der Weyden and the Bedford Workshop''. En: Von Kunst und Temperament : Festschrift für Eberhard König, Brepols, Turnhout, 2007, pp. 217. Caballero Escamilla, Sonia, Nouvelles recherches sur ' La Vierge à l' Enfant' de Petrus Christus conservé au Musée du Prado, Annales de la Societé Royale d'Archéologie de Bruxelles, 69, 2008, pp. 39-53 [42 f.2]. Martens, Didier, Un emprunt à Rogier de la Pasture dans l' oeuvre de Bernart de Aras' pintor vecino de la ciudat de Huesca', Annales de la Societé Royale d'Archéologie de Bruxelles, 69, 2008, pp. 16-37 [23-31 f.6]. Martens, Didier, Una huella de Rogier van der Weyden en la obra de Bernart de Aras, `pintor vecino de la ciudat de Huesca´, Archivo español de arte, LXXXI Enero-Marzo, 2008, pp. 1-16. Campbell, L. Van der Stock, J., Rogier van der Weyden 1400-1464. Master of passions, Waanders Uitgeverij - Davidsfonds, Lovaina, 2009, pp. 214-215, 386-388. 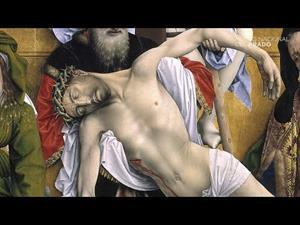 Martens, Didier, La 'Lamentation aux figures aux paupières baissées' une oeuvre perdue de Rogier van der Weyden? 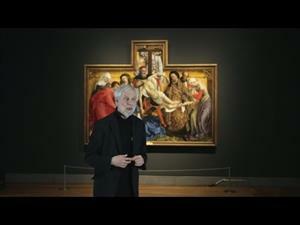 En:, Rogier van der Weyden in context. Seventeenth Symposium for the study of underdrawing and technology in painting. Leuven 22-24 Oct. 2009, Paris-Leuven-Walpole,Ma, 2012, pp. 318-329. Zutter, E de, Perrin, M, Le triptique de la Vierge à l' enfant avec des anges musiciens, sainte Catherine et Sainte Barbe' a l' église de Jérusalem à Bruges, Institut royal du patrimoine artistique IRPA Koninklijk instituut voor het Kunstpatrimonium . Bruxelles, 34, 2013-2015, pp. 77-95 [81-82]. Martens, Didier, Los primitivos flamencos y la recepción de sus propuestas en el Reino de Castilla, Boletín de la Institución Fernán González, 1, 2013, pp. 122,f.1. Alba, L. García-Máiquez, J. Gayo, M. D. Jover, M. Silva, P., Las prácticas artísticas de los pintores ''hispanoflamencos'' en la Corona de Castilla en el siglo XV, Boletín del Museo del Prado, XXXII, 2014, pp. 122-147 [124 f.1b]. Ruiz Quesada, F, 'Del Internacional al Ars Nova. Flandes y la pintura del arco mediterráneo de la Corona de Aragón en el siglo XV', Aragón y Flandes. Un encuentro artístico (siglos XV-XVII)., Universidad de Zaragoza, Zaragoza, 2015, pp. 78-99 . Lacarra Ducay, Mª C., 'Las relaciones artísticas entre Aragón y Flandes durante la Baja Edad Media', Aragón y Flandes. Un encuentro artístico (siglos XV-XVII)., Universidad de Zaragoza, Zaragoza, 2015, pp. 40-65 . Campbell, L. Pérez, J.J., 'Rogier van der Weyden. 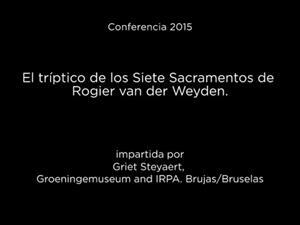 La Virgen con el Niño' En:, Rogier van der Weyden y los reinos de la Península Ibérica, Museo Nacional del Prado, Madrid, 2015, pp. 82-86 n.2. Inv. Nuevas Adquisiciones (iniciado en 1856). Núm. 1553. Catálogo Museo del Prado, 1942-1996. Núm. 2722.